Players and staff at Leeds United Football Club are to donate a day's salary to help fund a four-year-old fan's cancer treatment. Toby Nye has high-risk neuroblastoma, a rare form of cancer, which spreads rapidly across the body. The treatment needed is not routinely available on the NHS but One Day for Toby - held on 27 October - will raise the £200,000 needed to pay for it. Chairman Andrea Radrizzani said he had been "deeply moved" by Toby's story. "At Leeds United we do things as a family, Toby is part of our family and he needs our help," he said. "I know our supporters will unite behind us and together we can get him the treatment he needs to get better." 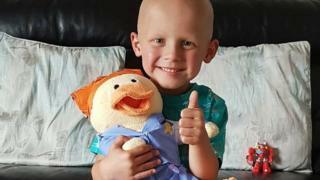 Toby, who lives in Osmondthorpe, Leeds, became ill at Christmas and on his fourth birthday in January, his family was told he had a stage four neuroblastoma tumour. Doctors told him he would need intense chemotherapy and radiotherapy as well as an operation to remove the main tumour on his kidney. His current treatment has been unsuccessful and the family is hoping to raise enough money to fund private care. The players, backroom and office staff at the club will join those from the Leeds United Foundation and parent company Aser to donate their pay next week. The club said it would also encourage commercial partners to pledge a day of their own salary to help. Leeds United are due to play Sheffield United at Elland Road at 19:45 BST on 27 October and there will be fundraising activities held at the ground in the build up to the game. The family has raised more than £45,000 so far for Toby's treatment. Donations have been increasing on the family's Just Giving page, set up by Toby's mother Stacey Worsley, with one person who preferred to remain anonymous donating £5,000. The Leeds United Supporters' Trust has supported the campaign on Twitter, saying it is an "amazing gesture" from all those involved. Many fans have been sharing it under the hashtags #OneDayForToby and #MOT (Marching on Together). Deluded Peacock tweeted: "This club is oozing class! So proud to be a Leeds fan! #OneDayForToby #TeamToby"
Tony H posted: "What an absolute fantastic gesture & everyone from Andrea to the players & club staff should be extremely proud of themselves. #mot"
Mark Illing tweeted: "Keep fighting Toby. Pulling out all the stops to help this little boy is wonderful to see. Looking forward to contributing. MOT"
Replying to a tweet promoting the event from Mr Radrizanni, Bridget Emery said: "What a change in the way the club is run...got nothing but respect for you boss. Let's all join in to raise the money needed. #ALAW #MOT"
Earlier this year, Manchester United midfielder Juan Mata said he would donate 1% of his salary to Common Goal, which supports football charities across the world, and called on others to do the same. In 2016, Everton Football Club donated £200,000 to a cancer treatment fund for Sunderland mascot Bradley Lowery.